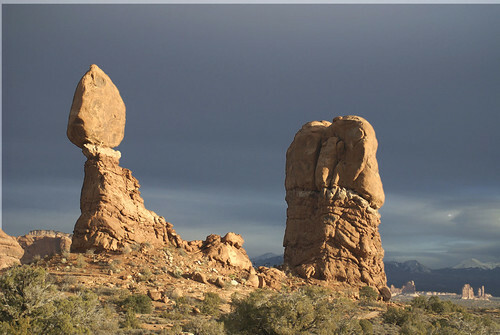 Arches National Park, located near Moab, Utah has a large number of variety of geological formations. As the name suggests it has over 2000 natural sandstone arches, including the world-famous Delicate Arch. Amongst these arches is located one of the biggest "Balanced Rock" in the World - almost the size of 3 buses. 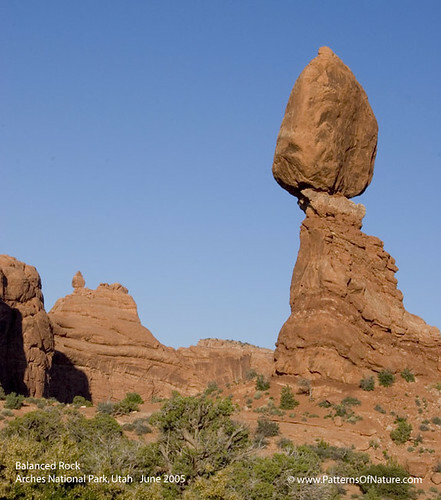 The total height of Balanced Rock is about 39 metres (128 feet) with top balanced rock having a height of about 17 metres (55 feet) from its base. As per Wikipedia this famous "Balanced Rock" is likely to fall any time. Till mid seventies there was another but smaller balanced rock next to the Balanced Rock. It was called "Chip Off the Old Block". It fell off during the winter of 1975/1976. Here is a link to an image taken in 1972 which shows both the Balanced Rocks. There is another great balanced rock at the Colorado National Monument. Thanks for the suggestion - I agree the Balanced Rock at Colorado is fantastic. I will make a post about it in future.